OMG Posters! 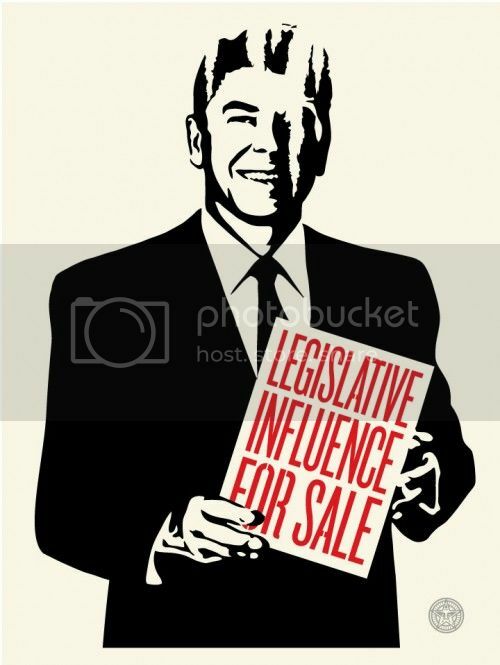 » Archive "Legislative Influence For Sale" Art Print by Shepard Fairey (Onsale Info) - OMG Posters! Shepard Fairey is kicking off a new print series with “Legislative Influence For Sale”. It’s an 18″ x 24″ screenprint, has an edition of 450, and will cost $55. It goes up tomorrow (Tuesday, May 24th) at a random time. Visit ObeyGiant.com. idea is great. Execution is blah. Well execution is really blah… the fake weathering is just odd. whats up with his face? arrrrgh. Every time. I so want to give this guy a chance. He is one of the OGs that got me in this poster game. Every week just disappointment surrounded in Boredom. Move on, legion. Let it go. You’ll feel better, I promise you. I’m a Shep fan, but this worked better as a street piece. Agree with Kenny, like the idea/message. Poor execution. Don’t get the deal with the tears in the face.If it’s to give it a wreathed or turn look he should have extended that into the body as well. Just looks like something thrown together last minute with no real effort put into it. i like it. back to the basics. what a load of crap and a weak political stance on top of it. and now its sold out, whether you like him or not hes a smart business man. wasn’t obama comparing himself to reagan? I think so. sell out is an understatement. Like obama doesn’t sell out to the unions. pfft. the art is crap on top of it.